Armored fighting vehicles designed or produced by the French Republic. French tanks tend to be extremely specialized tanks and each should be examined carefully before committing to play it. French tanks vary wildly between the tiers, due to the paradigm changes in historical doctrines around WWII. However, their core philosophy is geared around offensive action. At lower tiers, they accomplish this with trench-assault tanks with great armor, but are as slow as foot infantry and have mediocre anti-tank penetration power. At higher tiers, they are mobile and armed with great guns; but as very theoretical tanks developed in an era where HEAT made armour less useful, they sacrifice their armor in order to achieve that performance. Most mid or above tier French tanks have an autoloader with a drum magazine, which allow for several shots in a short period of time. 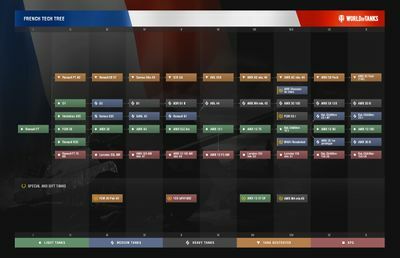 Almost all French tanks suffer from having few crew members which makes for less variety when choosing crew skills or perks, lack of sufficient hull and turret armor at mid-high tier, lack sufficient speed and mobility at lower tiers, and their guns almost always have long aim times. All are meant for offensive action; lower tier French tanks rely on their armor to withstand enemy hits (especially machineguns, and autocannons) and higher tier French tanks rely on their speed to position stealthily and avoid hits. Lower tier guns tend to have poor anti-tank penetration, and will have trouble stopping other heavily armored vehicles advancing on them without premium munitions. Conversely higher tier tanks will find themselves handicapped on the defensive, due to the extremely long reload times on the automatic loaders. On most tiers, poor turret armor prevents them from using hull-down positions effectively. They also generally have very poor gun dispersion and aim times, which can be very frustrating and inconsistent. French light tanks are slow and have thick armour at lower tiers, but with the paradigm shift in WWII armoured warfare they trade their armor for speed at higher tiers. They gain the ability to use autoloaders much earlier than the other French lines. Combined with their high speed and small size, they become deadly hit-and-run vehicles. They are also entitled for featuring the first wheeled line ingame: these are insanely mobile and stealthy partisan warriors, with the new mechanic of switching between an easier handling "cruise" mode and a faster rolling "rapid" mode. Despite low survivability in frontal clashes, they are capable of sneaking in a sudden hard blow, posing serious threat to slow rolling heavies or unsuspecting TDs. However, drawbacks include that these armored cars in general have way below average view range, and require quite a bit of space and practice to execute maneuvers. French medium tanks are few, and there's a big gap between the tanks that lead to the French Heavies and those that come from the French Lights. The latest update adds some new mediums at tier 3-5 alongside the B1 which lead to the ARL at tier 6, and alongside the Bat-Chat at 9-10. They typically have characteristics similar to their light and heavy tank counterparts at their tier. French heavy tanks start from tier 4 with a good mix of armor and mobility, although the very first tank down the line has a dual gun setup yet fires a tiny 47mm turreted gun. As the tiers rise, the guns get better, while they continually trade armor for agility. Branching off from Tier 8 onward, the two heavy lines feature different playstyles. The auto-loading line use large caliber guns with automatic loaders, which make them very destructive, but with their paper thin armor, it is essential to keep moving. The breakthrough heavy line combines tough armor on frontal arc with decent mobility, making an ideal character for spearheading an early-game assault; these vehicles also have the choice between a harder-hitting large calibre main gun or a more accurate mid calibre one, providing extra flexibility. French tank destroyers have relatively weak armor at lower tiers, but have good guns. Later in the line, they gain tough frontal armor along with increased speed, but retain the good guns. Their guns have great penetration values and good accuracy, and high tier vehicles are also equipped with auto-loading mechanisms so they are not to be taken lightly. However, their side armor is rather weak and their front armor is covered in rather obvious weak spots. Due to their size, the later designs have poor camouflage values. French self propelled guns have good accuracy, quick aim times and high fire rates, but suffer from low gun arcs, slow-moving projectiles, and lower damage and penetration than their rivals. They are the fastest SPG's in the game and can outrun many of the tanks in the game. They also sport relatively great camouflage values thanks to their smaller sizes. This trend, aside from camo, remains throughout the line. The T9 and T10 artillery pieces are very fast indeed, able to relocate to newly freed locations on the map and continue to support their allies from unexpected firing angles and get closer to the battle to compensate for their low-velocity shells. They are also some of the best artillery at defending themselves and make decent emergency TDs. At T10 the French get a unique SPG with a turret and a 3-shot autoloader. It boasts the second best accuracy of the bunch, and some very nasty burst damage, able to track and retrack tanks to keep the beating on and to give allies something to shoot at. However the splash and damage are as expected, underwhelming. The load time is also horribly long, at a whopping 52 seconds at the very best, so aim well. This page was last modified on 9 February 2019, at 15:51. This page has been accessed 3,132,503 times.